"They seek him here, they seek him there...well, you know the rest." I must admit, going into this new, BBC version of The Scarlet Pimpernel, I honestly had no idea what to expect. I knew nothing of the story, and had never seen a previous film incarnation of the classic novels. So, it can be said I same into it completely fresh, with no pre-conceived ideas about the project. That said, after the whole near 5-hour affair, I'm a bit worn out. The production is top notch, but whether or not it really delivers the goods will be up to the individual, I think. 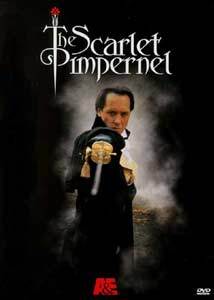 This 1998 series (which debuted on American TV in 1999), divides the story into 3 movie-length episodes; The Scarlet Pimpernel, Mademoiselle Guillotine, and The Kidnapped King. Disc one of the set sets the stage with the story of how a French agent Chauvelin tries to set the Pimpernel's own wife against him. When she refuses to help, the Blakeney's are put into prison and are suspected of having something to do with the whole rebellion in France. Disc two, Mademoiselle Guillotine, has the Scarlet Pimpernel attempting to help the daughter of a wealthy aristocrat, Marquis de Rochambeau. She is being threatened by the secret police, and things are complicated when even the simplest people are being set against them by threats of violence and bribery. Disc three, The Kidnapped King, has the Blakeney's pretending to separate. This way, the Pimpernel's wife can pretend to get closer to the old adversary, Chauvelin, and gain information about a missing orphan who may be the heir to the French throne of rule. As you might expect, the first show has more introductory elements, whereas the others jump right into the thick of things. While the entire story-arc is entertaining and a generally strong adventure tale, it feels too long. The central performances are very good (especially Richard Grant's), and the opulent design is superb, but it seems a bit much. Sometimes, a bit of compression to the stories can provide a better flow and I think Pimpernel may have benefitted from this. Now, Pimpernel is by no means bad. It's an extremely well put together period-piece with amazing attention to presentation. It just takes a little long to build up steam and has certain scenes that are, in my opinion, far too long for simply setting up basic plot and events. A certain stiffness overtakes the production, making it a bit awkward at times. As I understand it, though, the adherence to the material from the original stories is rather good, making this something that fans of the stories may appreciate more than the previous film incarnations of the character. Regardless, there's still some good, solid storytelling here and when it does get going, the show certainly embodies the excitement one might think of from the classic portrait of this character. Image Transfer Review: Some slight over-softness and compression artifacting are present in the image, but otherwise this is a clean transfer. Pimpernel presents itself in full-frame, the original aspect ratio designed for the television broadcast, with lovely colors and black-level shading. Audio Transfer Review: All episodes contain a stereo soundtrack (with Pro-Logic center encoding). It's not quite as expansive as one might wish, but it gets the job done painlessly. Very good, clear dialogue is featured (noticeably excellent quality in the recording), and most sound effects and music get some stereo effects added to them. There is no surround activity and no bass extension of any notice. Extras Review: Other than English subtitling for the deaf, the only feature any of the three discs have are DVD-ROM weblinks to A&E's website. This is mildly disappointing considering the length and scope of the feature; a "making-of" feature would seem warranted. The packaging is fairly nice, though. For fans of the Pimpernel stories, this boxset will provide a rather epic blast of entertainment. This is an excellent production that, though a bit slow at times, is still television drama at its best. Recommended.